Swedish players after card games such as blackjack, baccarat and poker can head online and gamble safely and legally. 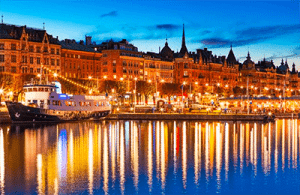 While there’s just one licensed company with sole power over online gambling in Sweden, players can still head to offshore sites which offer the best card games online. When it comes to gambling in Sweden, land-based gaming is legal and regulated by two pieces of legislation. 1. The 1994 Lotteries Act oversees lotteries, bingo, roulette, dice games and even card games in Sweden. It is enforced by the Gaming Board of Sweden which issues licenses and oversees all games, including card titles, are being run fairly and responsibly. 2. The Casinos Act 1999 which adds to the aforementioned piece of legislation, regulating roulette and dice games too. It also deals with age limits, rules, and other regulations which relate to land-based casinos in Sweden. In 2002, several amendments were made to the Lotteries Act to keep up with the rapidly evolving online gambling environment. The main change was Sweden’s state-owned company Svenska Spel became the only authority to host online games. This move did not sit well with the European Union, which has said Sweden is breaking international trade agreements since the government has full control over online gambling. Sweden has said it will open the market to offshore operators, but at the time of writing, it has not happened. A review, which commenced at the end of 2015, is expected to be concluded in March 2017, and could see a potential change in legislation. Regardless, Swedish players can visit offshore online casinos without facing any penalties. We recommended doing your research when playing at foreign sites to ensure they’re safe. The majority of the poker sites we detail are available to gamble at legally and each are licensed by the best regulators in the industry. If you prefer to play blackjack or baccarat, as well as poker, opt for the recommended offshore online casinos, all licensed by advanced gaming jurisdictions. There’s a number of sites we recommend Swedish online card players visit – many accept SEK and allow the site to be in the Swedish language. The software for these poker sites can be downloaded by both PC and Mac Swedish players. 888poker: This poker site claims to have an audience of around 10 million players and offers 7 Card Stud, No Limit & Pot Limit Games, Omaha, Omaha Hi Lo, Ring Games, Seven Card Stud Hi Lo, BLAST, Texas Hold’em and SNAP – the fast-fold variant popping up at all the best poker sites. Swedish players can change the language to Svenska and deposit and withdraw in SEK. You can download the client or play via your browser here. PokerStars: You can only download the software if you want to play at PokerStars, one of the biggest poker sites in the world which is endorsed by some of the best celebrities in the world, including Cristiano Ronaldo. You can find poker variants and card games including Texas Hold’em, Omaha Hi/Lo, Seven Card Stud, Razz, HORSE, Badugi, Courchevel, 2-7 Singe Draw, Five Card Draw, and 2-7 Triple Draw. Unfortunately, the Swedish language isn’t available to enable here, nor is SEK as an available currency but you can opt for English and play in EUR. Full Tilt Poker: Opt for this site and you will have to download the software to access the huge range of poker on offer including Texas Hold’em, Omaha Hi, Omaha Hi/Lo, Rush Poker, Razz, 5 Card Stud, Stud, Stud Hi/Lo, Draw Poker and mixed tables. Svenska isn’t an available language, and you can’t play in SEK but EUR is available and Swedish players are still accepted. Online casino sites offer a range of table games, pokies and casual games too, in case you want to dabble. All Slots: Swedish players can head to this Microgaming powered online casino and find a huge range of blackjack, baccarat, RNG poker and more card games on a downloadable platform – or play via your browser. Svenska is an eligible language to select and you can play and win Swedish kronas. What’s more, players who play in SEK are treated to 10x the normal welcome bonus – US and AUD players are limited to 200 credits, irrespective of the currency and exchange rates, but SEK players get 2000 credits. Guts: Guts online casino is powered by Net Entertainment, Microgaming, BetSoft and other software providers meaning you get a huge range of card games with differing features. Set the language to Svenska and play in SEK, then choose between baccarat, a range of poker variants or even the live card games by Evolution Gaming. 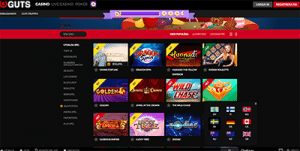 Royal Vegas Casino: This site is perfect for the dedicated Swedish players out there, with the Swedish language eligible to be enabled and SEK currency to be played in. You can play a range of table games from the traditional blackjack and baccarat games to more unique titles such as Red Dog a progressive poker variant. There’s a huge number of payment methods available for Swedish players including Visa and MasterCard debit and credit cards, where you can quickly and securely enter your card details to make an online casino or poker site deposit. Web wallets are also ideal – Neteller and Skrill both accept Swedish players and allow SEK to be deposited so there will be no currency conversions between using your web wallet and withdrawing from the online casino. Visit the cashier for other available methods and follow the prompts to get playing real money card games in SEK.